I can’t believe how long I have been making this dish. When I first made it, my daughter was 11 and my son was 5, boy oh boy, that is hard to fathom right now. I just made it again tonight, 14 years later……. Needless to say this is another kid friendly dinner, served with noodles, from fine to broad or rice: I’ve done them all. Tonight it was fine noodles and a simple salad. I have used many different varieties of apples and each one imparts a little different flavor, which is fun. The frozen apple juice can be any kind, it doesn’t matter. Make sure you have heavy cream. I have tried to get away with half and half but it’s just not the same. I even forgot it entirely one time (that’s why I now make sure to put it next to the pan while the chicken is simmering, that way I won’t forget). It was ok but I like it a lot more with the cream! Finely chop the onion and set aside. Cut apples into 4 wedges, peel and core. Finely chop by hand or with the Cuisinart Mini-Prep. Finely chopping the apples is important. 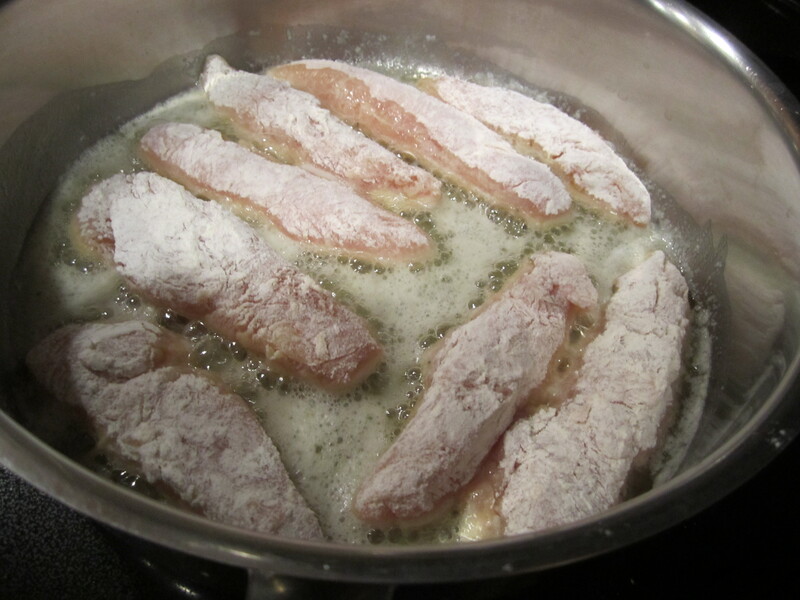 They need to cook quickly because the chicken tenders cook in no time at all. Set aside the chopped apples. 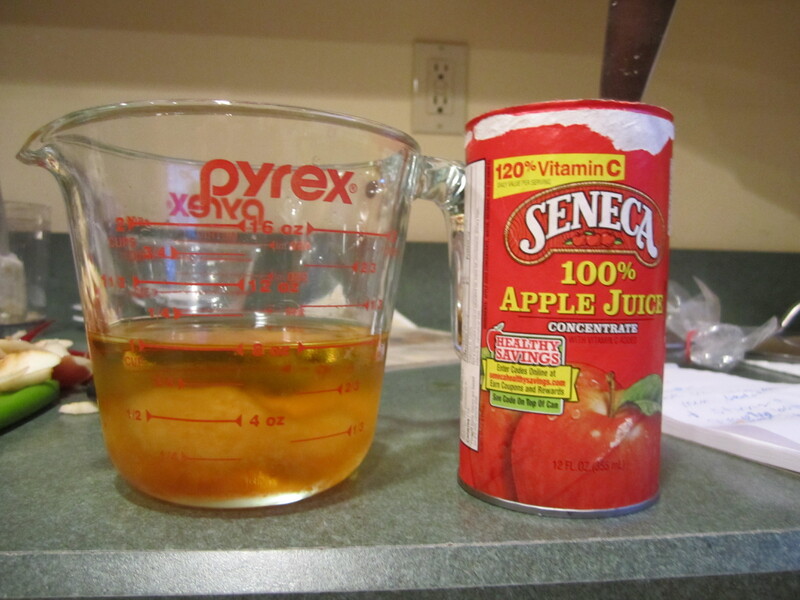 Put frozen concentrated apple juice in glass measuring cup and add water. Stir to dissolve and set aside. In a plastic bag, put flour and thyme. 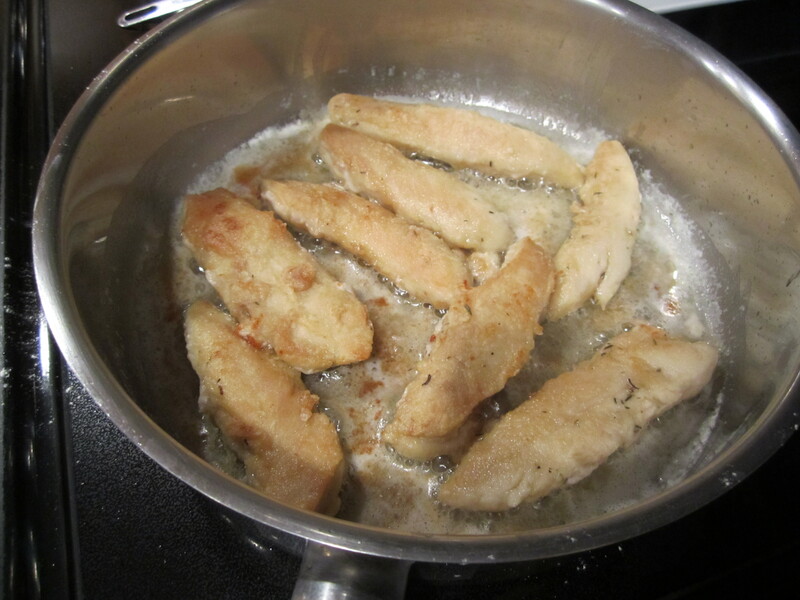 Prepare chicken tenders by cutting the white ligament out (see post Chicken Tender). Put chicken in bag and toss to coat thoroughly. Heat butter and olive oil (I love this combination, the best of both worlds. The great cooking qualities of olive oil and the wonderful taste of butter) in a large saucepan over medium heat. 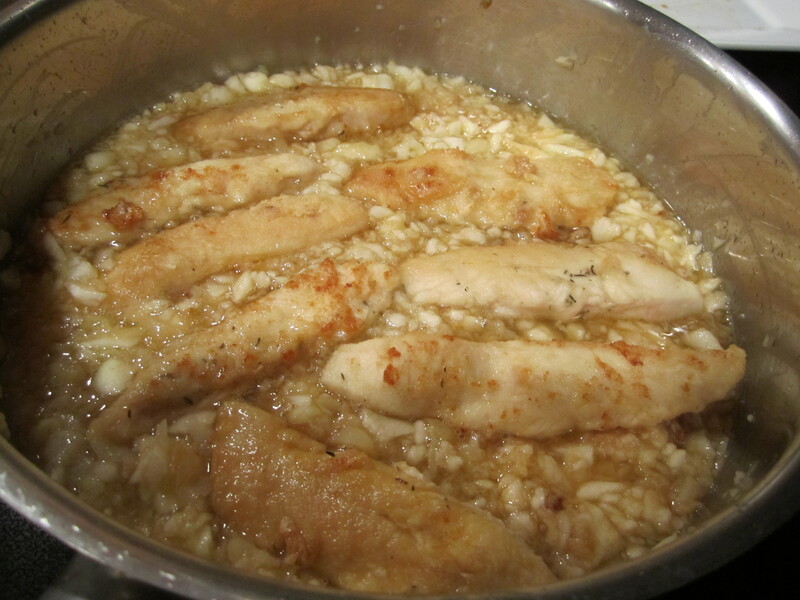 Place chicken in saucepan and saute until nicely browned, about 10-15 minutes. 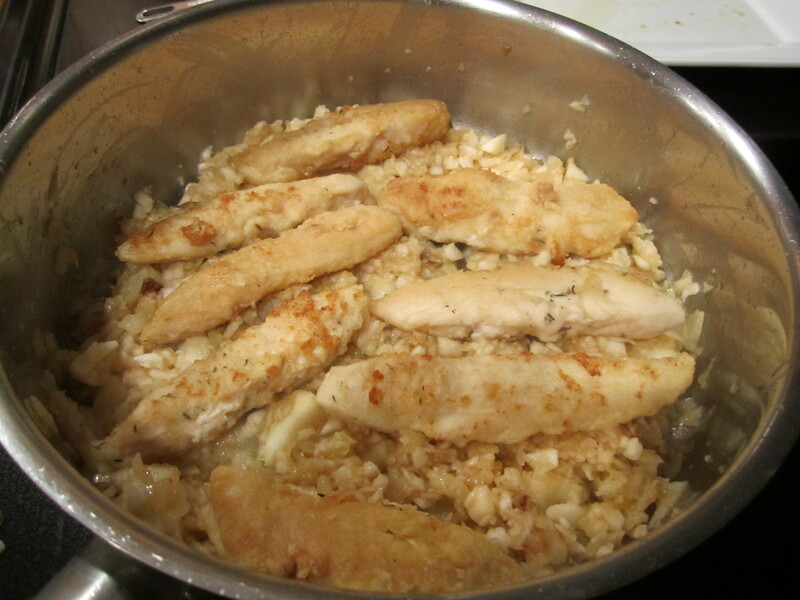 Remove chicken and set aside. 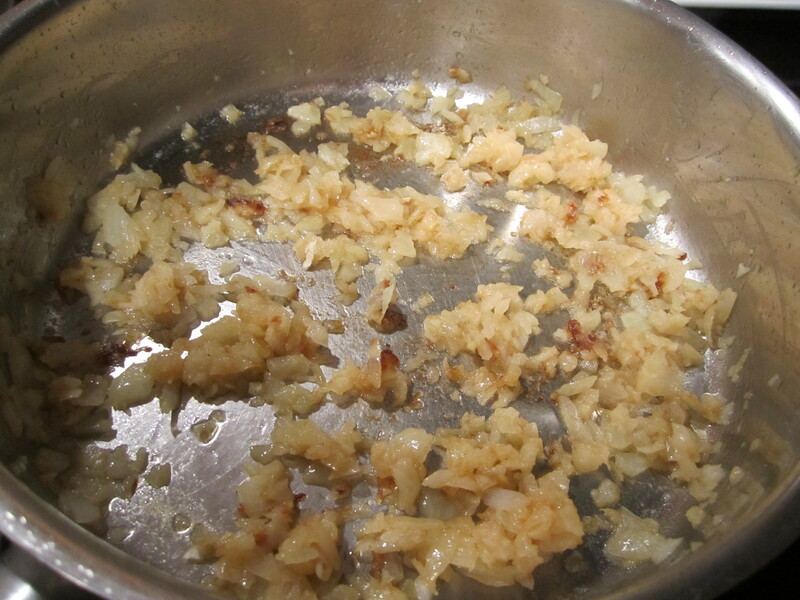 Add onion to saucepan and cook until lightly browned, about 5 minutes, scraping up brown bits from chicken. 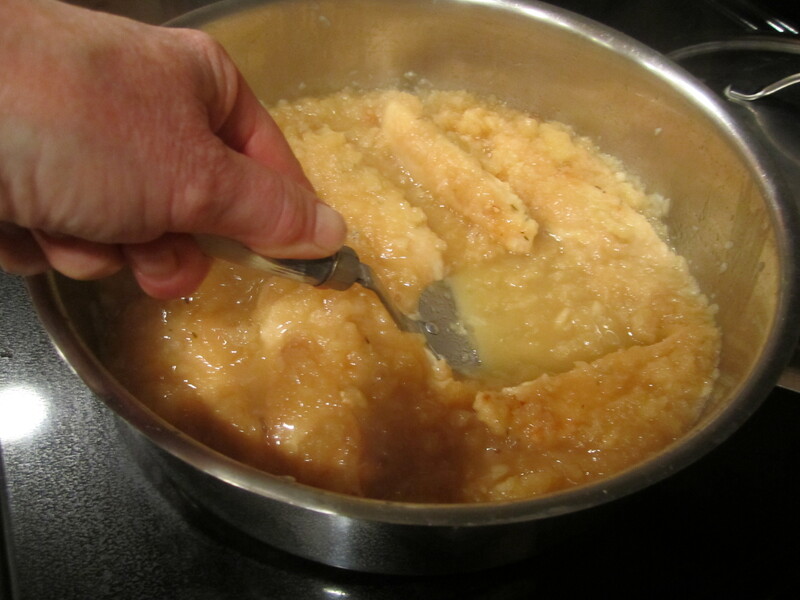 Add apples to saucepan and stir to combine with onions. 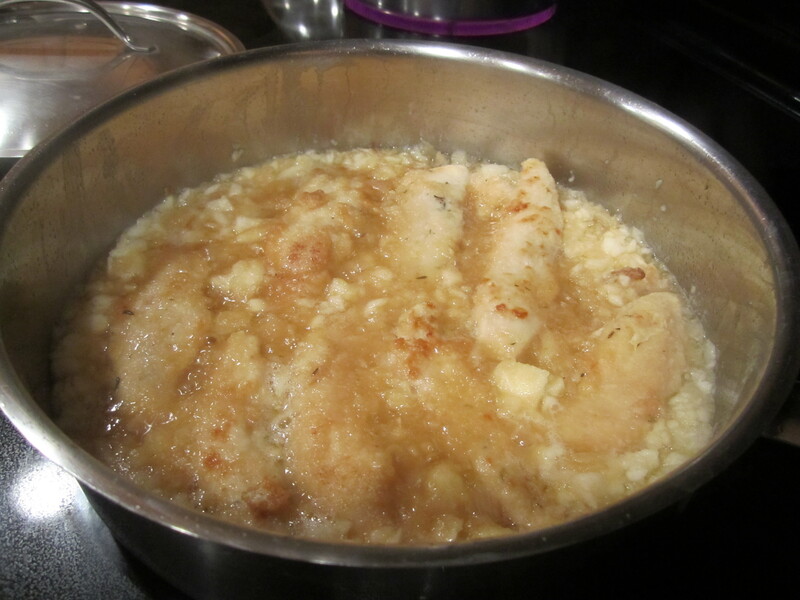 Place chicken on top and pour apple juice mixture over everything. Turn heat up to high and bring to a boil. Then reduce heat to medium low, cover and simmer for 20 minutes. Measure out heavy cream and set aside next to sauce pan. When the 20 minutes are up, uncover and push aside the chicken. Using a metal spatula, smoosh the apples a little bit more. They will still be somewhat chunky and that’s fine. 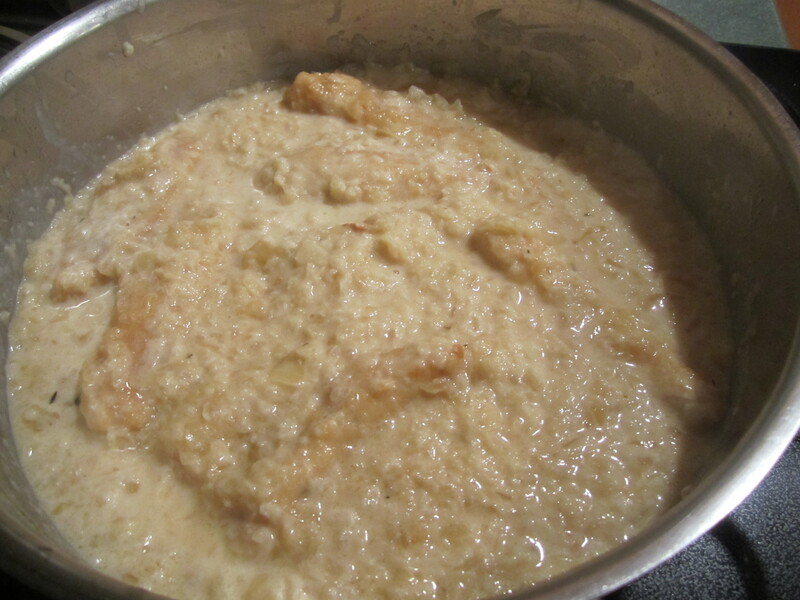 Turn off the heat and add the heavy cream, stirring it in gently, using the metal spatula. 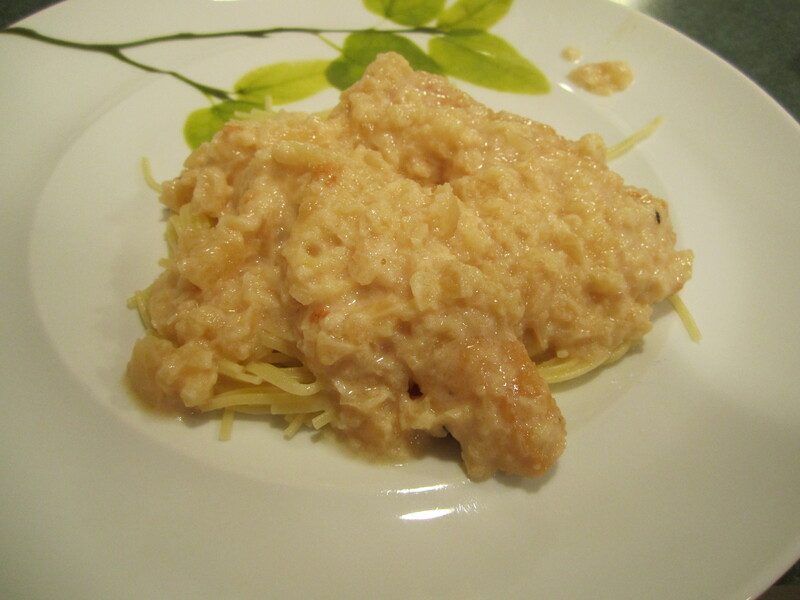 Serve with noodles or rice. 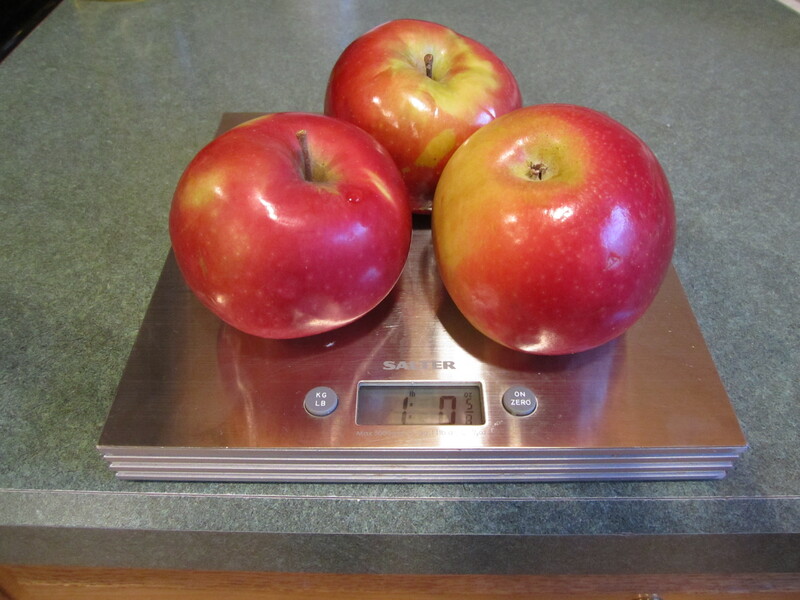 Weighing out the apples. See how the Scale comes in handy?